I'm rebuilding an '04 Giant OCR 3. It's got the Sora groupset. When I got the bike, the front derailleur wouldn't shift. I found both adjusting screws tightened all the way in. I've backed them out, and they now shift. However, it goes from small inner ring gear to large outer ring gear in one click. I push the thumb lever once, and it pops back to the small gear. I can then only push the shifter lever to shift back up (down?) once. Then it won't shift anymore. I've checked the shifter and it says "triple" right on it. There are no such markings on the front derailleur, but I can't find any visual difference between a double and a triple on the internet. Was my front derailleur swapped out from a triple to a double? or am I just an idiot and somehow messed up some adjustment? You may need to clean/lube the shifter. Shoot some WD40 in there, let it dry/run out, then shoot some lube in there. 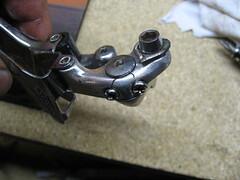 The front derailleur isn't in control of the shifting, the shifter is (just an FYI). 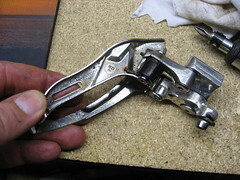 The shifter is not catching one of the "clicks" on the travel of the lever. Go to the Park Tool web site, find the instructions for setting up and adjusting derailleurs. Do all of the steps in proper sequence leaving nothing out. 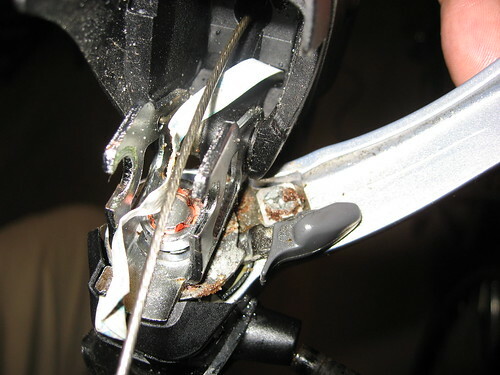 If you have had the cable off the front derailleur lately, chances are that it was reinstalled in the wrong location. Look at the end of the cable arm outboard of the cable attachment screw. If there is a groove on the end of the arm then the cable goes over the end of the arm and then to the attachment screw. 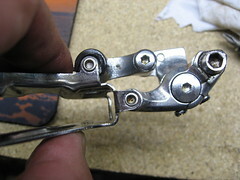 This will change the ratio of the front derailleur enough so that it works for the triple. Edit: After seeing the pics: In the first pic there is a tab sticking out over the retaining washer on the cable attach point. Go over the tab from the inside and then under the screw/washer. Last edited by maddmaxx; 01-07-08 at 11:10 AM. I fully soaked them in WD-40, and properly lubed them. They aren't like new, but they look and feel 300 times better. Al, I love the Park Tool repair section! The front derailleur section worked great (why it shifts to/from the small and large ring gears), but the article assumes that you can control the shifting to shift it to the middle gear - which I can't... so, I'm stuck. I suspect that the previous owner tried to adjust the derailleur and cable to act as a double instead of a triple. If you will release the cable from the derailleur, release all of the cable from the shifter by shifting into its lowest position and follow all of the Park Tool instructions I suspect you can make it function properly. But I could be wrong. Al, ok... I'll try it tonight. Thanks.